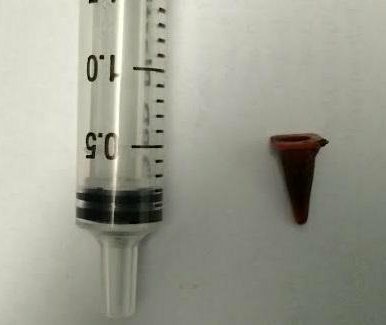 Doctors discovered a small plastic traffic cone in a 47-year-old British man’s chest he had received for his seventh birthday. The BBC reports that the man, who was a long-time smoker, went to the doctor to have the cough checked out. Medics believed it was a tumor stemming from the smoking habit, but when they finally performed tests on the man, they discovered a foreign object was causing the cough. It was a “long lost Playmobil traffic cone” that the man received on his 7th birthday. According to the British Medical Journal, the man confessed to his doctors that as a kid he would frequently swallow toys. He even recalled swallowing the traffic cone, but he didn’t experience any any ill-effects for decades. Because he was so young when the toy was swallowed, doctors say his airway may have been able to adapt to the toy’s presence.